Now, now, don’t get upset. I didn’t hate Destiny 1, but there were some things missing that could have made it better, more enjoyable. Something that didn’t feel like a bland version of Halo. 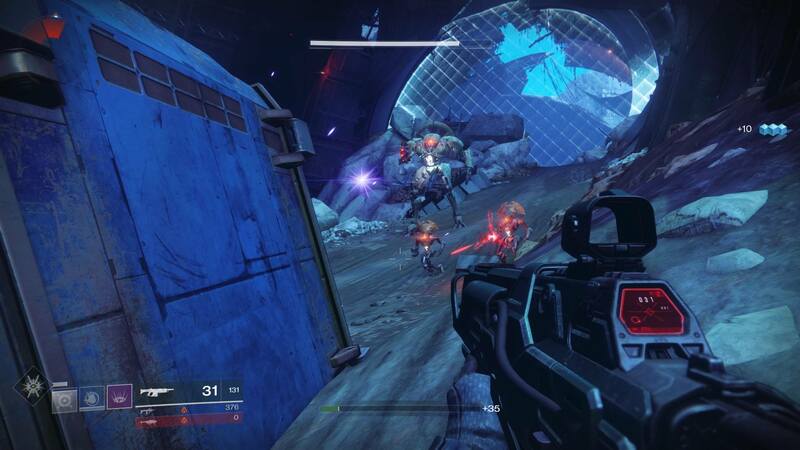 I wanted to love Destiny because I wasn’t a fan of Halo, and the Destiny aesthetic really appealed to me. But the biggest thing that killed it for me is that there was no central figure to fight, no real story. 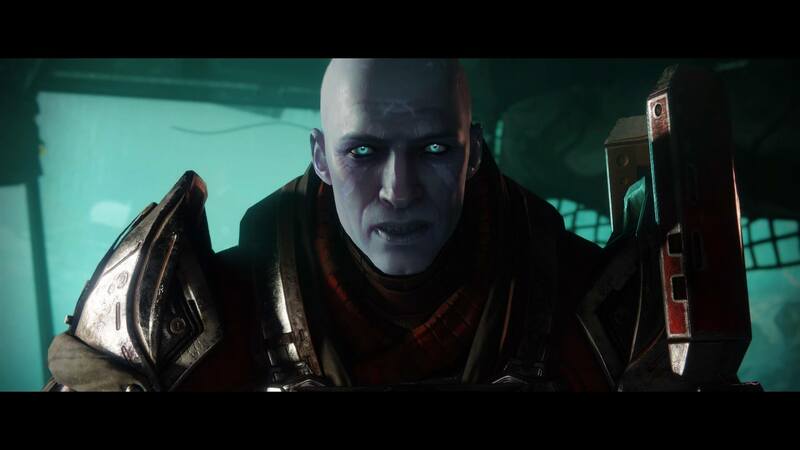 The only character that had any appeal or interesting characteristics in my eyes was Cayde-6. I’m so glad he came back for this adventure. But Destiny 2? There’s a story! It’s a lovely, gut wrenching story. Within 10 minutes I had an idea of what we were fighting, why, and had my feelings punched repeatedly. Destiny 2 is what Destiny 1 could have been, but alas, was not. But that’s okay! We have this now. It’s not all sunshine and roses though; I do have some gripes and qualms, but they are far and few between. It’s not hard to get here. So, you start off with a “decent” Light Rating of 100. You have a good amount of strength, but it’s quickly taken away as Gaul arrives. The Last City is destroyed, the Tower is no more. He, with no effort or even so much as a care, obliterates you and your forces. Your Ghost is damaged, your body discarded. Now, I do feel like Gaul is kind of a walking cliche’, but I enjoyed how he was written anyway. We at least have a goal now. I think it’s kind of a weird decision to have the Ghost do all of your talking, but at least it’s clever. This leads me to one of the frustrating game mechanics in the early game: there are so many areas where you can’t respawn because your Ghost no longer has the power to resurrect you. Sure, from a storyline perspective, it makes sense. The Light is gone, after all. You need a new source of power, which does conveniently come along. But I found myself dying far more than I should to silly stuff. And on that front, the NPCs seem to be a bit smarter. Grunts would run me around towers and structures if I got greedy, used cover wisely, things of that nature. The only ones that ran out mindlessly were supposed to. Now, if you’re far away, they don’t really do much to you. It’s when you’re in-range, and they’re in a nice big group that they work together. Despite the early “no respawn” zones, the game’s pretty easy. 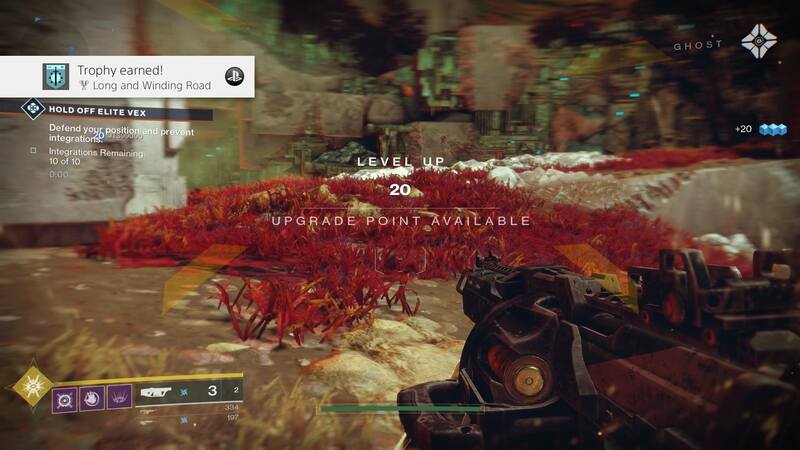 If you were good at Destiny 1, you’ll likely be good at Destiny 2: the enemies are pretty much the same. Forget the Tower… get to the Farm! The areas are new and shiny as well. From the foliage of the European Dead Zone, the intense waves and platforming of Titan, to Io and Nessus, there are lots of new (not to mention gorgeous) zones. Each planet definitely feels different, and there is a lot of ground to cover on foot. There aren’t tons of teleport spots, but there are enough to get to the content that you want/can complete. It’s not all just straight forward, do the campaign and nothing else. The Heroic Missions are a great way to get exp, seals for reputation and gear. If that’s not your bag, and you’d rather work alone, each planet also has a series of Solo Adventures, which takes you through a little mini crusade of destruction. You can only do them once, at first. Eventually, you’ll unlock the ability to do these Adventures again through your liaison on the planet. That’s who you’ll turn in Seals to for Reputation, buy items with Glimmer, et cetera. There are plenty of Strikes, there’s Raids, Crucible, and once you’ve completed the main story, you’re really just getting started. All of these places drop loot. Lots of loot. Guuuns. As far as leveling and the story goes, my personal recommendation is to worry about the leveling first. I chose not to focus on the story, and instead saved milestone rewards and items for when I’m 20. My rewards were a bit better and scaled to my current level/power rating. RNG is still very much a thing, and more often than not, I received drops that were only slightly better than my current gear, but never did I get a drop that was garbage or not ideal for me. I do appreciate that even at 20, your gear rewards aren’t all trash. Another recommendation: keep your highest item level gear on you at all times, even if it’s something you don’t want to use or it. From what I’ve found, your gear drops/rewards will slowly scale up from what your best gear is. There have been some weapon changes, though. Minor, but they are there nonetheless. Sniper Rifles, Fusion Rifles, and Shotguns were moved into the “Power” category, and with the Submachine Gun and Grenade launcher added to the mix, you’ve got so many options. It’s still important to mix and match your elements and gun-types, but I did find myself more aligned with Auto Rifles, Pulse Rifles, and for my Power Weapons, Rocket Launchers, Grenade Launchers, and Sniper Rifles. I am grateful that it’s pretty damn easy to get powered up to do the end-game content and explore even more. First one’s free. No, really. Though, as far as Items go, I have to mention it, because it infuriated me. In Destiny 1, Shaders were able to be used infinitely. Once you had them that was it. Sure, you can unlock Common/Rare Shaders from Adventures and such, but the really good stuff? You have to go through the microtransactions. That means real money, friends. In addition, you can only use them once, and only on one part of your armor! Why? 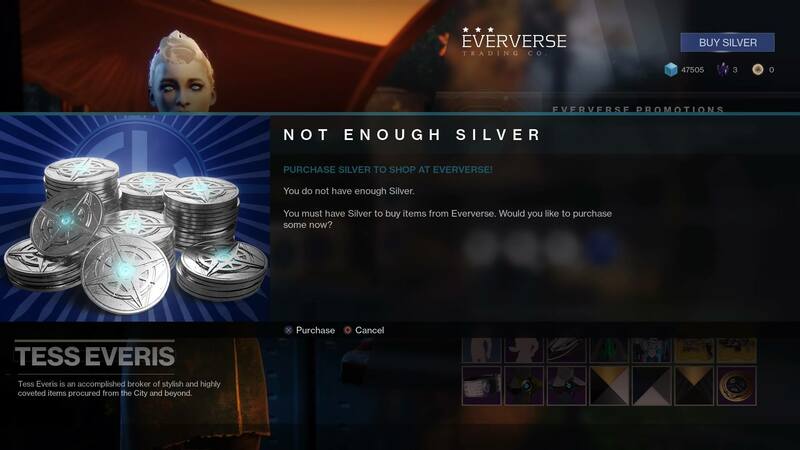 Why did Bungie walk down the dark road of micro transactions? This hurt my enjoyment of the game immensely because it wasn’t a necessary feature for a AAA, full price, buy-to-play game. What can you get in these Boxes? Shaders, not a big deal, they don’t affect the game. Emotes, I don’t really care about these either. However, here’s where I draw the line in the sand. There is a shot at Elemental Weapon Mods, which can increase your damage/adjust the way your weapons work, or Armor Mods to make your regeneration in certain subclasses better. That definitely upsets me. Sure, you can argue that it’s not a “big” change or a “game-breaking” change, but it’s a change for change sake. Oh, and you can get your vehicles there too. It upset me to see because it’s not something that was a necessity. The greediest change is the Shaders, without a doubt. Before, you could change your look as you leveled, and match your clan, or just because you wanted. Now you have to hoard them and make sure they all look good together, and with the frequency that I gained new gear, I have yet to use a single Shader. Too afraid to. Though there are at least NPCs to interact with now, in the Faction Leaders, that’s about it. 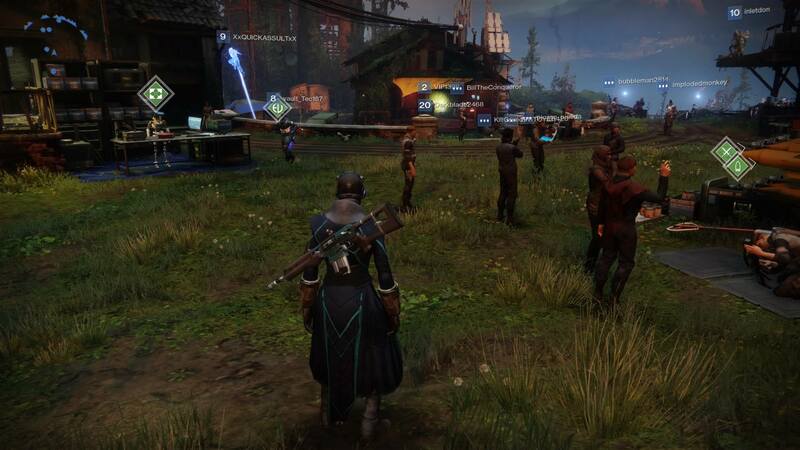 You get voices on comm from time to time, then there’s Cayde-6 and a few others, but for the most part, you’re all alone. The only times you really see other people are when you ask friends to play with you, or at Heroic Events. More often than I’d like, I had to try and solo those events, and spoiler: it didn’t go so well. Adventures are fun, the story is great, but for the most part, I felt kind of alone out there on these worlds. I’d like to see more NPCs, even if I can’t interact with them; maybe other Guardians that are trying desperately to set things right. I think it’d be an interesting story choice. We know we are special, but we aren’t the only Guardians. There was a literal whole tower of them; some had to survive. Speaking of Guardians, each class has three sub-classes that you can pick from, one at the start and the others are unlocked via side-quests later in the adventure. You gain Skill Points as you level to 20, and while yes, you can complete level-20 adventures to gain more Skill Points, I think it’s wiser to hold some of them back and wait until you level cap and decide what you really want to walk. As a Warlock main, I had fun with all three sub-classes (Dawnblade, Voidwalker, Stormcaller). 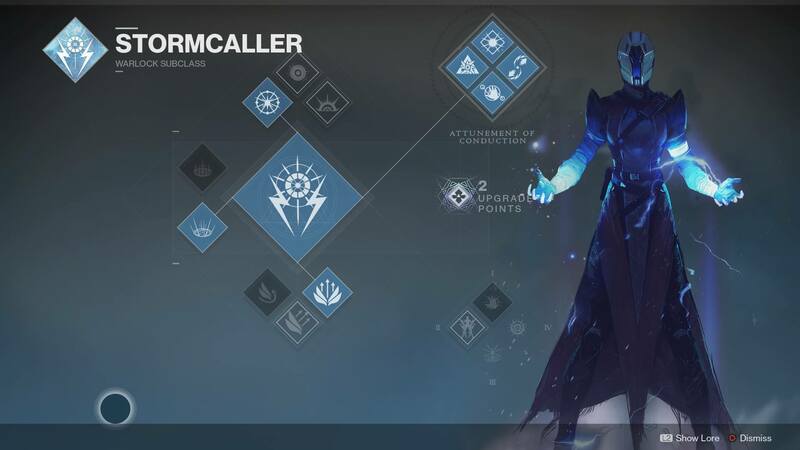 Each has a use, but my favorite is probably the Stormcaller. Lots of Force Lightning and everyone can have some! For Titans, you have Sentinel, Striker, Sunbreaker. Hunters stay sneaky with Arcstrider, Gunslinger, and Golden Gun. Each of these classes has an Element tied to it, Arc, Solar, or Void. All told it’s been a positive experience, but what about post-story? 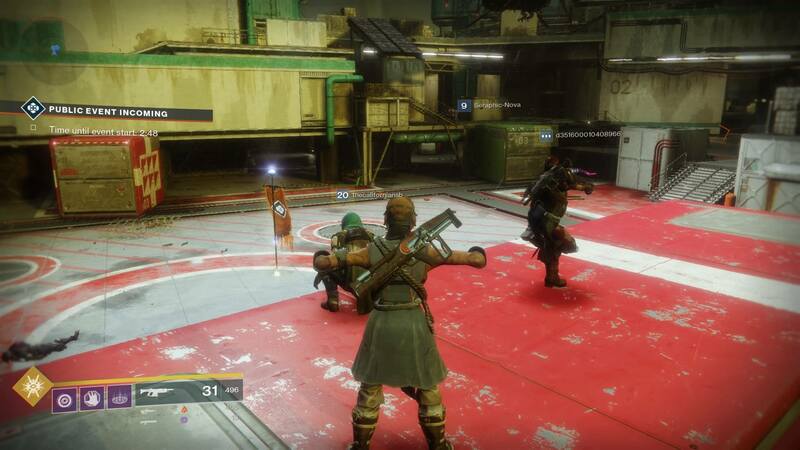 Heroic Event, or just an impromptu dance-off? There is an absolute slew of content post-game, and I’m just getting started. If you hit 20 and didn’t finish the story, there’s that. You can go back to Faction Leaders, continue to do the quests, missions, etc that they offer to learn more about them and get sweet rewards. Then there’s the option to redo Missions if you’d like. If you want to replay a key moment in the game or some of your friends are doing them and you’d like to lend them a hand? Go for it! Do you miss the best NPC in the game, Failsafe? Go listen to her wonderful dialogue and shoot the daylight out of bad guys. Strikes, Raids, you’ll have plenty of that content too. There’s also lots of loot to gain, without a whole lot of grind. You know all of those awesome chests that drop out in the world? Get the cool Discs, the Seals I mentioned earlier, take them to the owner of them and get some incredible rewards out of it. 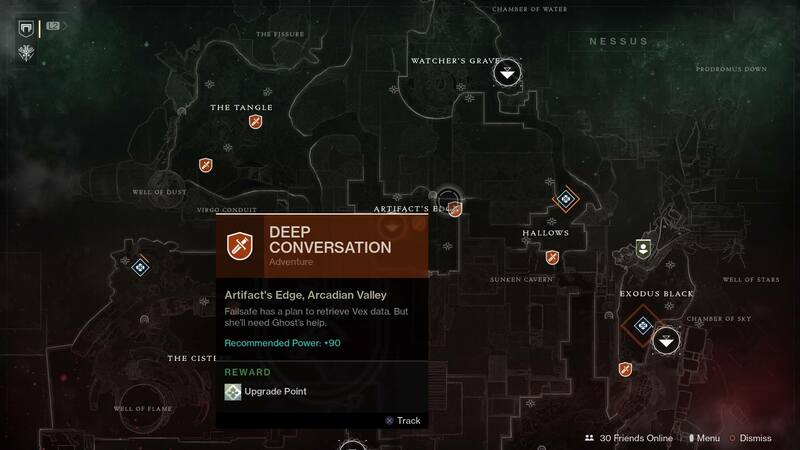 Each planet has high-value targets, public events, chests to go find. There are a few other things, but that crosses into spoiler territory, so I’ll leave that be. But trust me, there’s content to go around, and even if you can’t find something to do, and have friends that play? Do whatever they’re doing. No matter what you’re into, you’ll find something to do here in the end-game. Honestly, this is the Destiny I’d liked to have seen the first time around. I was a little bored with the original “story”, but this one is giving me what I need: snarky dialogue, sweet gear, and a lot of bullets. The difficulty is not insane (in fact, it’s pretty damn easy), but incredibly enjoyable. Very fun with friends (feel free to join the Bottom Tier clan on PS4, cheap plug!) and there’s always something in the world for you to do. Not once have I sat and said, “Hum. There’s nothing to do on any of these planets!” The microtransactions are the biggest, most insulting part of the game though. I knew about them before I even purchased the game, and it seriously gave me pause. It was almost enough to not buy this because so many full-price games have gone this route. It’s not enough to spend full price on the game, then expansions, and the online fee to play on PSN/XBL. 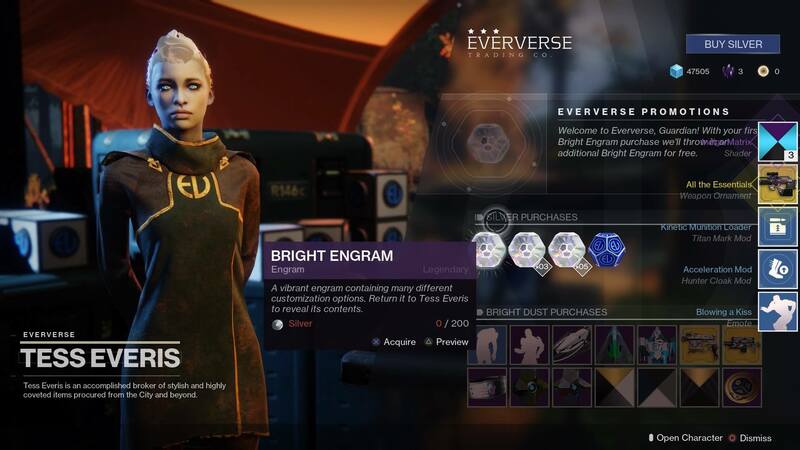 Now we have to spend real money to get shaders to match our friends/make our characters look unique? That’s absolutely loathsome. Go in guns a’blazin’! It’s not hard! This aside, the game is still fantastic, and you are under no compunction to spend money. It’s just regrettable that they chose to walk this road, and I pray that it does not get worse. It does not feel mechanically different from Destiny 1. It’s mostly the same, and if you enjoyed the last one, you’ll love this one. I do admittedly wish I could see the map without holding the Touch Pad for three seconds. A minor gripe, but one that did start to frustrate me. The formula that Bungie devised has definitely been improved upon. PVP is still infuriating unless you’re godlike/well-geared in fairly equal amounts, but it’s not something you are ever required to do. It’s still pretty fun with friends, to just mess around and shoot other players. The Red Legion is here, and you will definitely feel like you are contributing to their defeat in this adventure. There’s so much more coming too. Destiny 2 is a sci-fi fantasy epic worth undertaking.